I’ve never been interested in the tradition wet felting techniques, probably because I’ve shrunk too many jumpers by accident, but needle (or dry) felting has so many permutations from small figures to pictures that it has grabbed my interest. 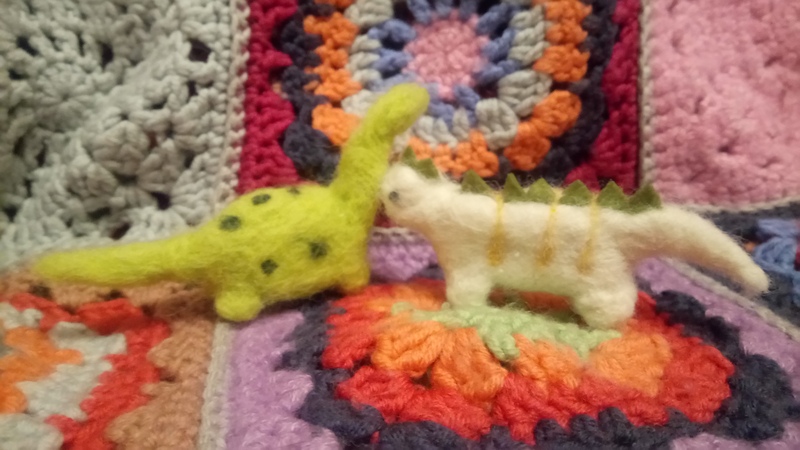 I’ll admit I’m a bit slow, I’ve known for a few years that a friend’s mum makes the most amazing animals and birds, her Wee Woolies, and yet it never “clicked” that I could try it. I’ve been doing some reading up; this is a recently new technique. As with tradition felting the aim of the process is to twist and tighten wool fibres together to make a dense mass, forming blankets, mats, etc. This is possible as wool fibres have tiny scales which lock together – probably why it so hard to pull down an old garment. Traditionally this matting was done with soap and water, however in the 1950s felting machines were made which used special barbed needles to make non woven mats. The needles have tiny barbs which when inserted into the wool push the fibres together but can be extracted smoothly. The idea of using these needles individually for creative purposes occurred in the 1980s when Eleanor Stanwood developed the process. Felting needle – sewing and tapestry needles will not work, the barbs of a felting needle is required to pus the fibres. Needle holders are available, some of which can hold multiple needles to speed up the process. 38-gauge needle – a general all-purpose felting needle. 40-gauge needle – a fine needle ideal for adding details or finishing, do not leave visible holes. Felting surface – required to prevent stabbing our leg. Generally a foam block but specialist mats are available, which look like an upturned brush stopping the fibres getting trapped in the block. Finger protectors – not essential but can protect against jabbing yourself with the needle. I may get some if I do much more felting, although I imagine it’s a balance between dexterity and safety. I picked up a couple of basic kits during a shopping trip the other week in Hobbycraft. One of dinosaurs the other unicorns. These started with you working adding the roving to a polystyrene form, by the time the figures were complete the inner ball had been jabbed so many times it was loose polystyrene beads. I imagine in time I would find it easier to simply use roving and build up the shape. It is simple to build the shape you want by adding extra roving as required, adding limbs and filling in joins. Adding decorative spots stripes and even felt triangular ridges to the dinosaur was a lot easier than I expected. I took yellow and green from the dinosaur kit to give the unicorn a rainbow mane & tail. I can see me collecting a wide variety of colours as I do more of these. I started this as a “let’s see if I can do it” project but found I enjoyed it a lot. I can achieve the same level of extended concentration as I do paper-cutting. I’m not sure if I will ever attempt a “painting” but I can see me doing more creatures. “Curse your sudden but predictable betrayal” Don’t worry if you don’t get the reference.